ISAT and Kinetics vibration isolation fiberglass isolaters. There is NONE BETTER for Engineering services, manufacturing and testing capabilities - all backed by the industry’s most experienced staff. KIP pads are applied in a wide range of noise, shock, and vibration isolation uses. Recommended whenever a consistent natural frequency under a range of loads and permanent load support characteristics are important. A range of densities and spring rates are available to provide load-bearing capacities from 1 to 500 PSI (0.07 to 35 kg per sq. cm). Uniquely allows a wide range of loading on a given isolator while maintaining a constant natural frequency. 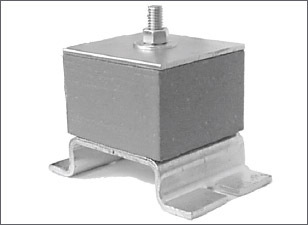 Isolate audible frequency vibration or noise produced by small utility vent fans, vain axial fans, high speed motors and roof mounted exhaust fans with lowest operating speeds of 1750 RPM when mounted on a grade supported slab or pier with a bolt-down and vertical lift control feature. 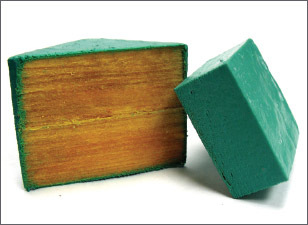 The fiber glass pad offers a constant natural frequency over a wide load range.